Zoo's lemurs get to eat a special Thanksgiving meal Wednesday, in the a.m.
Lemurs at the San Francisco Zoo enjoyed a special Thanksgiving treat a day early. The San Francisco Zoo is serving up Thanksgiving dinner Wednesday -- except instead of turkey, mashed potatoes and pumpkin pie, the diners are feasting on fruit salad, sweet potatoes and monkey food. 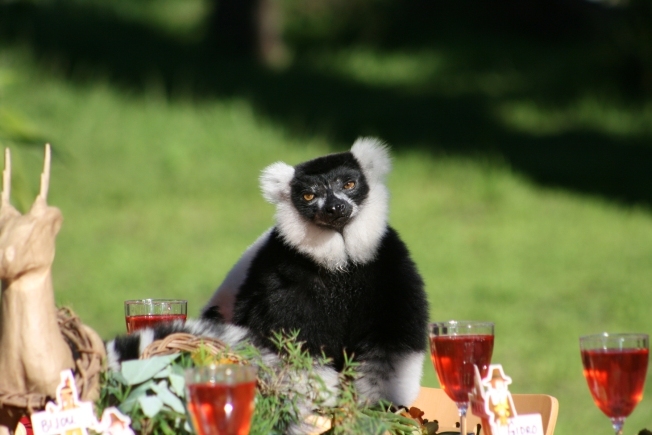 The diners are 15 lemurs that will have to dig and claw their way to their meals, which will be in decorated boxes. Zoo officials said the exercise is part of the zoo's behavioral enrichment program and is a way to engage the lemurs and help them to get more exercise. The group consists of six ring-tailed, four red-ruffed, three black-and-white, and two black lemurs, according to the zoo. Dinner was scheduled to be served at 10:30 a.m.